Welcome back to another week of Mom's Library at Ready-Set-Read. Each week I cohost Mom's Library with TrueAim and a group of mom bloggers. This is a linky party where you can share activities for kids, recipes, devotionals, tips for moms, etc. Not only can you share your ideas, you can also find wonderful ideas in the "library" link up each week. When you share your idea, you have the opportunity to be featured on the Mom's library pinterest board or on a post by one of the mom librarians. This week I am featuring great ideas that were shared last week that focus on ideas to learn through play. Each week we also offer a giveaway on Mom's Library! Be sure to subscribe so you don't miss the next Library! Follow the Mom's Library Pinterest Board to see all of our featured posts. In the past week, I've had numerous conversations with early childhood experts, kid bloggers, and moms about the importance of play in early learning. I've engaged in discussions with educators and concerned parents about how play is fading from many kindergarten programs. Often play is misconstrued as a waste of time. Many parents think the focus should be "more academic". 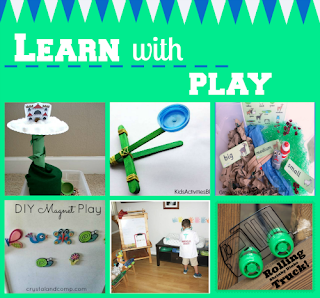 Today I am sharing some awesome ideas of learning through play. All of these ideas will challenge your child's mind to develop in a playful way! Catapult for Kids to Make from Kids Activity Blog-- A catapult would be another great way to explore force and motion! Enter to win a free subscription to Thrive Art. This is an online art program for kids and is valued at $99. You can read about the program and enter to win on the rafflecopter below. (If you are reading this post via email, you'll need to click over the the post to enter). Great set of features again this week. Thank you for including our sensory activity bin. Extra bonus points for selecting links that all shared the same colors in them! always good info and ideas. Your linky is really taking off! Linking my Rosh Hashanah resources - this is our theme this week!